The main counterargument is that the moratorium would stifle web innovation. Since web innovation is currently defined as “emulating native even more,” I think a bit of stifling would actually be a good idea. Once web innovation is redefined as something that’s actually about the web we can proceed as usual. Another counterargument is “But we need feature X!” Everybody will have a favourite upcoming feature that would be hit by the moratorium — mine is offline capabilities. But an extra round of defending the need for feature X without any reference to native apps sounds like a good idea to me. The final counterargument is IE6. 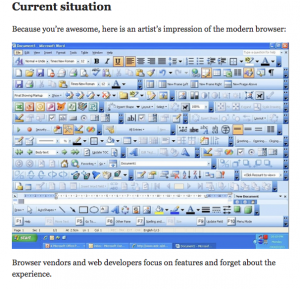 Web development was seriously hampered in the five years that Microsoft refused to upgrade its browser. 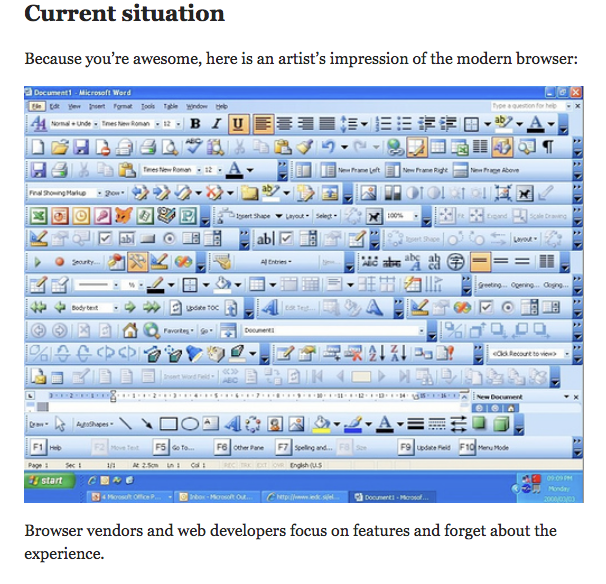 New features were pushed into the other browsers, but not into IE. Limitation spurs creativity, I remember that period quite fondly. Being forced to work around IE6’s issues required quite a bit of creativity, and although not every solution stood the test of time (most libraries and frameworks from that era, for instance), it still made the creative juices flow. It would be good to return to that creative mindset for a while. Not for five years — that’s clearly too long — but a break of about a year or so sounds great.